Heat oven to 375°F. Make and bake drop cookies as directed on pouch. Cool completely, about 30 minutes. Set aside 4 cookies for garnish. In food processor, process half of the remaining cookies to coarse crumbs. Remove to medium bowl. Continue to process second half of remaining cookies to coarse crumbs; add to bowl. Stir in melted butter and 1/2 teaspoon of the vanilla until well blended. In ungreased 13x9-inch (3-quart) glass baking dish, press cookie crumb mixture firmly in bottom. Set aside. In large bowl, beat cream cheese, powdered sugar and remaining 1 teaspoon vanilla with electric mixer on medium speed until smooth, scraping down side of bowl frequently. Beat in 2 cups of the whipped topping. Spread over cookie crust. 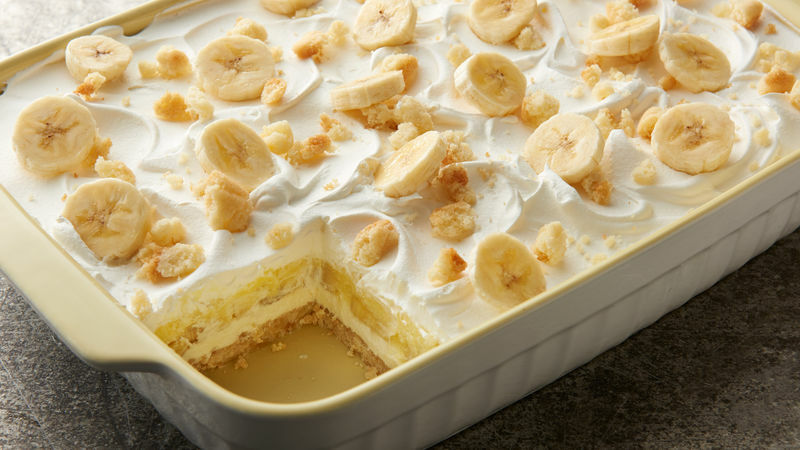 Place 2 1/2 cups banana slices in single layer over cream cheese mixture. In another medium bowl, beat dry pudding mixes and milk with whisk about 2 minutes or until thick. Drop by spoonfuls over banana layer; spread evenly over top. Drop remaining whipped topping by spoonfuls over pudding layer; spread evenly. Cover and refrigerate 4 hours. When ready to serve, crush remaining 4 cookies. Sprinkle pie with crushed cookies, and top with 1 cup banana slices. Cut into 6 rows by 4 rows. Cover and refrigerate any remaining pieces. To ripen bananas quickly, place them in a paper bag at room temperature for 1 to 2 days.